Habit: Plant generally cespitose; rhizomes 0 or short. Stem: 7--27 dm, nodes, especially lower ones, generally densely hairy. Leaf: auricles to 1.5 mm, ligule 2.5--6.5 mm; blade 15--45 cm, 3--12 mm wide, strongly rolled to flat, upper surface scabrous. Inflorescence: spike-like (rarely branched at lower nodes), 9--19 cm; spikelets 2--7 per node, sessile. Spikelet: glumes 8--18 mm, awl-like, stiff, keeled; florets 3--7; lemma 6.5--12 mm, acute to awn-tipped, glabrous to short-hairy; anthers 4--7 mm. Chromosomes: 2n=28,56. Ecology: Streamsides, canyons, roadsides, sagebrush scrub, open woodland; Elevation: < 3100 m. Bioregional Distribution: CaR, SN, ScV, TR, GB, DMtns; Distribution Outside California: to Canada, western United States. 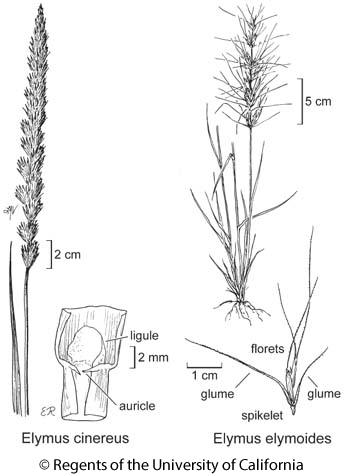 Flowering Time: Jun--Aug Note: Hybridizes with Elymus triticoides. Citation for this treatment: James P. Smith, Jr. 2012, Elymus cinereus, in Jepson Flora Project (eds.) Jepson eFlora, http://ucjeps.berkeley.edu/eflora/eflora_display.php?tid=24163, accessed on April 21, 2019. CaR, SN, ScV, TR, GB, DMtns; Markers link to CCH specimen records. Yellow markers indicate records that may provide evidence for eFlora range revision or may have georeferencing or identification issues. Purple markers indicate specimens collected from a garden, greenhouse, or other non-wild location.